As a blogger, I’m often asked to explain, “Why do I blog?” Frequently people assume the goal is to get a cookbook deal. That’s not why I blog and I’m not working towards a cookbook deal nor have I pitched one to a publisher. However, I have said that should one ever fall in my lap, I would certainly take it. I have said that to so many people over the years and I can still hear my voice saying that. It’s always been more of a joke and I was sure that would never happen. Here I am in total shock. Last week, I was offered a cookbook deal! By a really lovely editor!! And… I didn’t take it!!! I’m not usually a fan of meringue and meringue cookies. The main components being egg whites and sugar, I often find them too sweet. 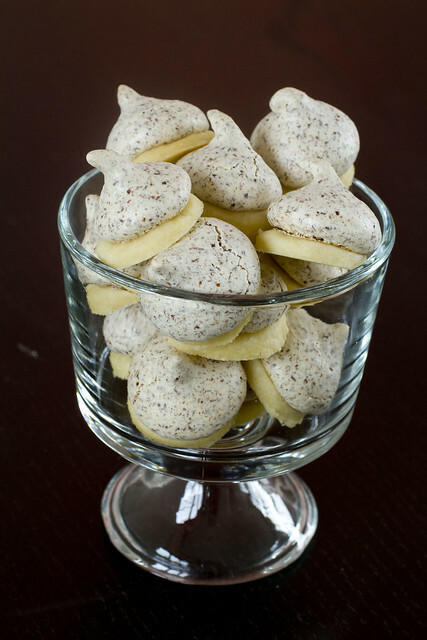 With these cookies, I’m going to call Black & White Kisses because it sounds so sophisticated. The use of 70% dark chocolate really balances out the sweetness. What I once thought of as a sugary, kiddie treat is now transformed into a light and airy adult indulgence. 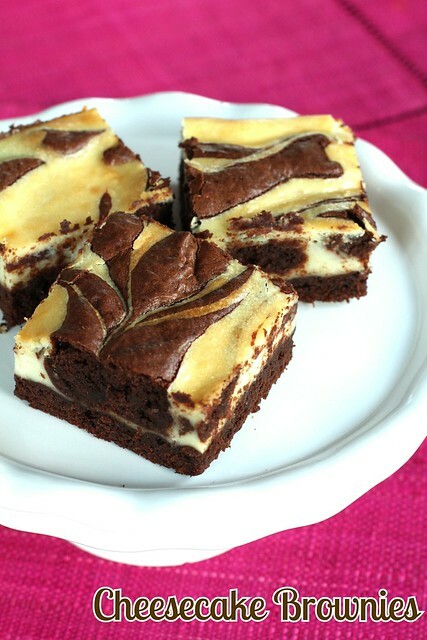 The bite size treat releases a puff of chocolate air that dissolves into the corners of your mouth. You may be thinking that this does not look exactly like the Black & White Cookie you just bought at the deli/bakery/bagel shop. You are right. I’ve changed this long time classic. 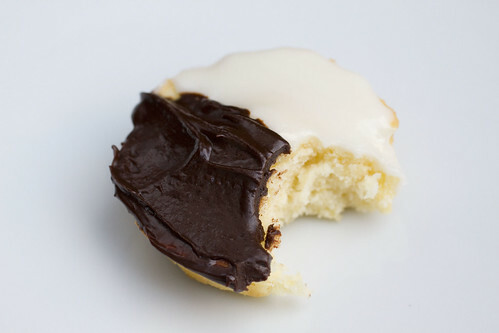 You see, I made classic Black & White Cookies from Carole Walter’s Great Cookies book. These big waist busting beauties were very good. I love the lemon oil that brightens and lightens the simplicity of vanilla and chocolate. But, the best part is the middle. I tend to like the thicker parts and not the thinner edges. I like that these are cakey cookies. I was determined to use this sweetened ginger I got a little while ago. I don’t know why I bought it but I guess I just do that whenever I see something new. 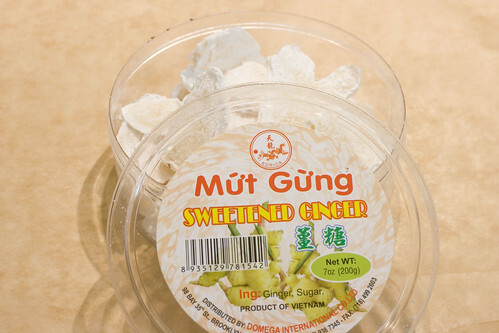 It’s similar to the concept of crystallized ginger but it seems to be made with confectioner’s sugar instead of granulated sugar.